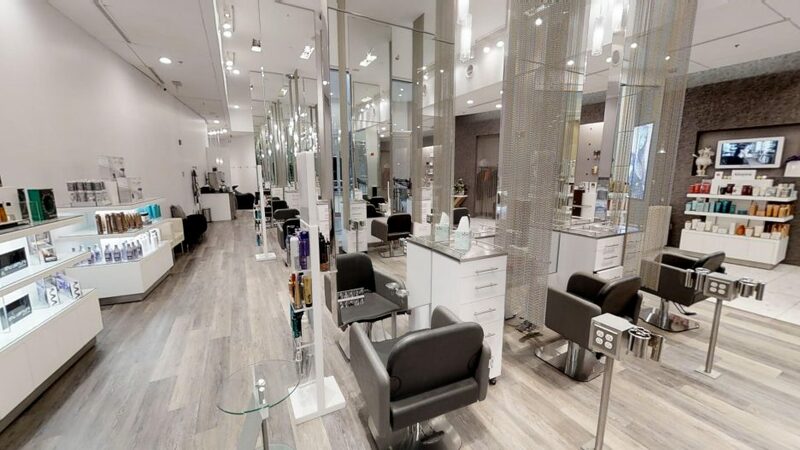 Our hair stylists at Dolce Vita at TYSONS GALLERIA utilize the five basic elements of good hair design when shaping your new look: proportion, balance, rhythm, emphasis, and harmony. By incorporating these basic principles we create hairstyles that look fabulously stylish and suit your features, hair type, personality and lifestyle. We offer a unique privacy room, which provides clients with an opportunity to enjoy their salon experience in a discreet area conveniently located within the salon. This space is often enjoyed by those who wear hijab to brides who simply appreciate a bit more discretion with their services. Please inquire about these accommodations when you schedule your next appointment. Color is often more artistic and emotional than scientific. Painters use color to evoke dimension, form, light, and mood. Our talented DOLCE VITA colorists will develop a color for you that is so brilliant and original it will express your personality, define your style, and bring out the best in you. Color services are priced separately from cutting, styling, and blow dries. Enhances your natural color, covers your gray hair or makes a bold statement, when applied from roots to ends. A quick touch up for your hairline, fringe and part. Creates a natural highlight, or dramatic effect, by applying one or multiple colors to specific areas of your hair. Creates a natural highlight, or dramatic effect, by applying one or multiple colors throughout the hair. A free-hand highlighting technique for exclusive, natural, and youthful looks. Tailored brush strokes of lights, brights, and rich tones render your natural hair colors with breathtaking beauty. Restores and improves hair damaged by incorrect color application. Our DOLCE VITA, Kérastase, and Shu Uemura treatment rituals are tailored specifically for you. To achieve the five pillars of transformation, our treatments nourish, shine, strengthen, smooth, and protect your hair. It’s like a 30 minute facial for your scalp. Indulge in the ultimate relaxation. Includes exfoliation, massage, & hydration. Experience instant hair transformation with a tailor-made treatment just for you. For every hair type. Concentrated nourishment from your roots to ends. Includes 10 minutes scalp massage. Each of these curated cocktails include our Shu Uemura therapeutic hair massage. Defy your dry demons with moisturizing gardenia oil + essential vitamins for utmost rejuvenation and enrichment. Treat your locks with a repairing blend of golden root extract + precious amino acids to restore solidity and strength. Leave it to our professionals to showcase the art of mixology. Customized and refined for a special treatment. An important characteristic in attaining beautiful hair is achieving a balance between its thickness and the quality of its texture. Even though hair can be fine, coarse, or unruly our experts at DOLCE VITA are equipped with the vision, innovative products, and the latest technology to re-texturize the very nature of your hair. Texture services are priced separately from Haircuts. We apply hair extensions by taking horizontal sections starting at the nape of your neck and continue every 1 to 1.5 inches. Your extension artist then works on subsections of 15 to 20 strands of hair at a time and applies bonding resin or micro links. We use bonding resin and micro-links that are extremely safe and won’t harm your hair. For more information, please click here. From the beginning our concept has been to create a space where men would feel welcome while they enjoyed the benefits of DOLCE VITA’s specialized knowledge in hair and nail care. We invite you to relax in our comfortable contemporary atmosphere as we provide you with the kind of service and experience that leaves you looking and feeling great. Remove current polish and apply base coat, polish of your choice and finish with a topcoat. Sanitize hands, trim nails, and apply polish of your choice. Enjoy a warm hand soak, nail trim and shaping, cuticle nourishment, hand massage and intense moisturizer with a hot towel. Followed with a polish application of your choice. Enjoy a warm hand soak, nail trim and shaping, cuticle nourishment plus an exfoliation with a sugar scrub. Followed by a hand massage and intense moisturizer with a hot towel. Finished with a polish application of your choice. A great maintenance treatment resulting in healthy happy feet, including foot soak, trimming and filing of nails, followed by Glycolic acid to exfoliate dead skin cells (when needed), cuticle care, callous removal, sugar scrub, foot and leg massage. Finished with a polish application of your choice. Enjoy the benefits of the Pedicure plus more attention with this rejuvenating and nurturing specialized treatment. Glycolic acid to exfoliate dead skin cells and work to penetrate deep into the skin leaving your feet noticeably softer and smoother. Followed with a marine mask to restore water to the skin and a polish application of your choice.